LEAD ACID BATTERIES - Imagine the environmental damage that can be caused by carelessly discarding 18 pounds of lead, two pounds of plastic and a gallon of acid - the average contents of a lead acid battery. Fortunately, scrap lead-acid batteries can be safely recycled. In fact, they have been recycled since the 1920's, and today these batteries have a higher recycling rate than other waste products such as aluminum, paper and beverage containers made of glass or plastic, to name a few. Over 98% of all used batteries are recycled today. With over 100 years of combined experience we feel that we are truly the Battery Specialists. Battery Specialists + Golf Cars is an authorized recycler for lead-acid batteries and will purchase your scrap lead acid batteries to help ensure lead acid batteries are safely recycled in a government approved recycling facility. 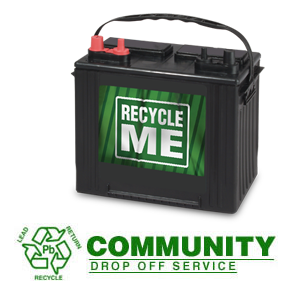 Do your part to keep our community clean and safeguard the environment for future generations by bringing us your used industrial, agricultural, commercial, automotive, marine and other small engine lead-acid batteries for safe and environmentally friendly recycling. Call the store closest to you for pricing. SPECIALTY BATTERIES - We also offer a drop off service for old nickel-cadmium (Ni-CD), nickel metal hydride, and lithium ion batteries. ALKALINE BATTERIES - AA, AAA, C, D and 9-volt batteries can be safely disposed of with normal household waste. Never dispose of batteries in fire because they could explode. Alkaline batteries are composed primarily of common metals-steel, zinc, and manganese-and do not pose a health or environmental risk during normal use or disposal.